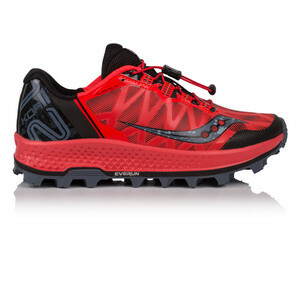 Tackle the most difficult terrain with ease in the Saucony Koa ST Trail Running Shoes. The Koa ST is designed to keep you on your feet and moving fast across soft, muddy terrains. The breathable, synthetic mesh upper works to keep your feet cool, dry and comfortable as you run. With excellent moisture management qualities, the build-up of sweat and moisture is actively and efficiently eradicated so you can focus on your performance and remain distraction-free. The Koa ST offers removable insoles, which work so you can replace them with any medical orthotics to help further the comfort. When fastening the shoe, a toggled quick lace system makes putting on and taking off the shoe extremely simple and quick so you are not hanging around tying your laces or worrying about them coming undone whilst you run. Saucony's EVERUN cushioning is three times more durable than Saucony's standard cushioning, and it delivers a greater energy return to put a spring in your step whilst you run. The cushioning is placed closer to your foot for increased responsiveness and therefore provides a smoother transition through the gait cycle. An oblique toe box allows maximum splay at toe-off for added stability while a reinforced heel piece provides protection and a lockdown fit.